Red Dots-what are you using, how much $, and where do you get them? I thought it would be a good topic to talk about the red dots we are using. Everyone knows that AimPoints and Ultradots are highly rated, but for us poor/cheap folks, a discussion about what else people use and if it's a good dot would be interesting and helpful. Be sure to put down if the dot works well and if there are any other attributes about the dot that might help your fellow shooter. 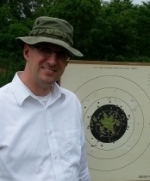 I have been shooting 30mm Adco Dots on both of my match .22s. Both were used on ebay for <$100. Pros: they work really well and have a nice crisp round dot. Cons: One is brighter than the other. I can't use the dim one outside on a bright day. On my 45, I am shooting a Burris FastFire II. Bought it used on ebay for $150. Pros: Small and lightweight. waterproof coated optics that dont dazzle when wet. Good dot, auto brightness. No machining for mounting the dot. Not in the way when clearing a malfunction. Cons: No clicks for elevation and windage, only screws that turn. On/Off switch is on the side of the sight, and it's easy to accidentally switch the sight off when you pull the slide back. Let the rest of us know what you are using. Re: Red Dots-what are you using, how much $, and where do you get them? I had a couple of Tasco Pro Point red dots that worked okay for a while. Eventually they quit and the only good thing that came out of them was the $5.00 each I got in trade for them from Larry Carter when I bought Ultradots. The $150 you paid for the used Burris is more than I paid for new 30mm Ultradot's. For your 22, the cheap $30 tasco 5moa red dot on amazon.com works just fine. Click adjustments aren't as clean as ultradot. Parallax is more apparent, but it's only $30. Just keep the dot in the middle. Millet makes a decent one that are on EBay a lot. One model has a smaller dot than the other. SP-1 and SP-2. Accurate and reasonable. Aimpoint Micro H-1's on all guns now. Bought them off either Ebay or Gunbroker for around $400 each. Ultradot 1" 4dots all the way. I got mine used with box for $125 but I'm thinking about adding one to my .22 for full price. The Matchdot is really nice. Micros wave of the future?? When I first handled the Aim Point Micro, I was not impressed, but after some study and experimentation, I believe it to be the ultimate set up.. Please describe the tube extensions. Your machinery beats my vice and file. I tried the Sig mini dot unit. It works good and has a Weaver foot. I stripped the screwhead right away though. I need a full length tube to have a comfortable sight picture. The 1" 4 dot UD is what I use right now. Jerry Keefer wrote: When I first handled the Aim Point Micro, I was not impressed, but after some study and experimentation, I believe it to be the ultimate set up..
Has anyone used a Bushnell TRS-25 or a Vortex Sparc? It would be nice to have something smaller on the .22 that's a little cheaper than an Aimpoint. Jack..here's a pic of the Pardini I mentioned..I can't get the Hammerli to down load, but it is almost identical in configuration. Are those Aimpoints really that much better than a 1" ultradot that it's worth all the trouble to fab up the tube extensions and what not? Rob Kovach wrote: Are those Aimpoints really that much better than a 1" ultradot that it's worth all the trouble to fab up the tube extensions and what not? Yes low mount is a must. And the tube extensions help with the alignment. Especially if you "lose" the dot. But your grip and recovery is supposed to not lose the dot. Also tubes help protect the lens from dirt. And I suppose extraneous light. I have two obsolete Aimpoint Comps. Still excellent sights, but I do not care for the big window on them. I do like the bigger dots in my 1" UD 4 dots. They mount real low with the Leupold "Rifleman" low rings. And I see a much nicer dot in them than in the regular 1" UD. Jerry, how many layers are on the frame here? I think I see a light colored piece, a dark middle piece screwed on, and the alloy mount. Jack, that is the first ever 1911 frame mounted Micro.. David Sams is a huge advocate, and pioneer of the fame mount, and Dave only lives a short distance from me..I used his already AMU proven method of frame attachment, which involves the silver soldering of a steel base to the frame for strenght and rigidity, then all I had to do was come up with a design for the Micro attachment/base. There are a number fail safes machined into the system to avoid vibration, and recoil shift. All the attaching screws are machined to just fit the counterbores to add extra reliabiltiy. I use Konus Atomics which are 1/4 the cost of an Aimpoint H1 and have a nice crisp 3.5 moa dot. 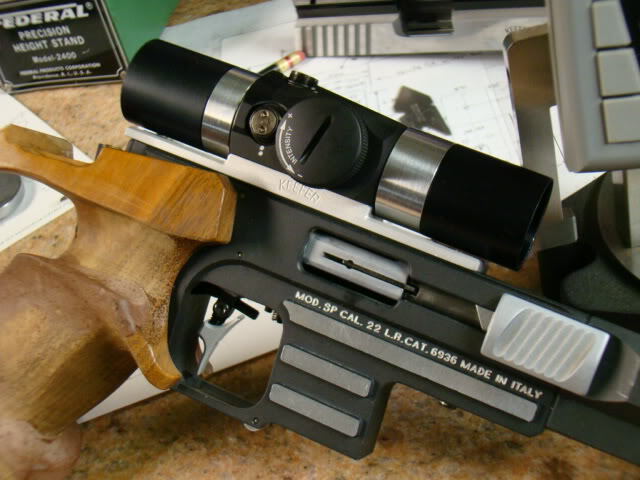 They weigh 3.5 ounces and mount directly to a scope mount like an Aimpoint H1. Make certain that you stick with all red dot version which has 11 intensity settings as opposed to the red/green version which has roughly half of that. Highly recommended. I also have a Vortex Sparc which weights 5.5 ounces. It costs twice as much as a Konus Atomic and uses a 2354 battery. Nice scope but I have no idea where to find replacements for that easily. I am new to "red dots",and have always subscribed to the principle of K.I.S.S. I am not sure I understand the base configuration for the Aimpoint Micro. Is it an integral Weaver type? Or do we need an adapter which I often see advertised, and I am very confused. 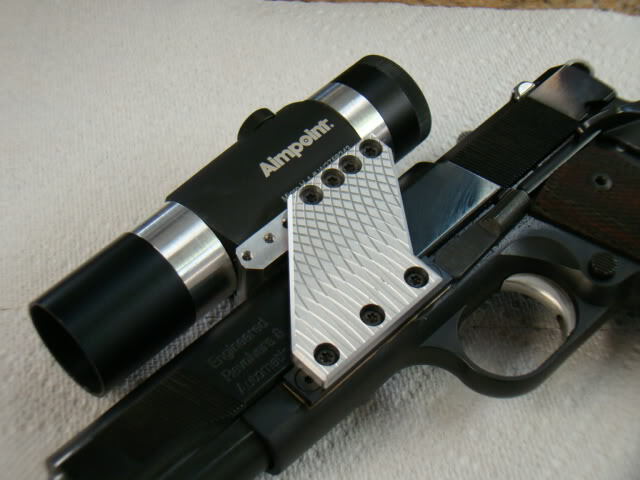 Regular Weaver mounting and Jerry Keefer's extensions would make the Aimpoint very ideal. If it's not an Ultra Dot it's a toy.